While the valley and east side of Los Angeles have endless amounts of taco trucks this phenomenon has yet to hit the westside. I can probably count the amount of westside taco trucks on two hands and when the sun goes down half of them go home as well. Garcia Bros is a truck on the westside that only comes out at night. Parked in front of an auto shop at La Cienaga and Venice this taco truck serves up a large menu of mexican fare with clayudas, quesadillas, tortas, memelitas and something called guarache to go along with the tacos and burritos. I ordered dos tacos de asada, un de chorizo y dos de al pastor. 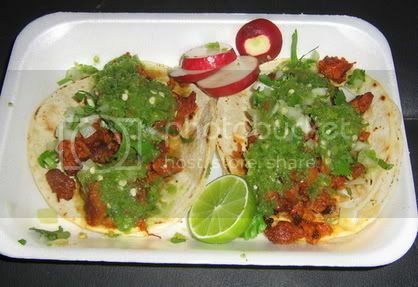 Each taco comes with chopped onions,cilantro and salsa verde. The salsa verde is really special. It's jalapeno based and I could taste hints of avocado in it. I suggest having a cold beverage handy because it packs quite a wallop. The finely chopped juicy bits of asada blend well with the strong presence of the salsa and between the juicy tenderness of the beef and the aroma of the salsa verde there was a lot of flavor here to enjoy. The chorizo was good but after having the chorizo tacos at Tacos Por Favor I dont think I can ever look at chorizo tacos the same way again. The bar has been raised to where I doubt it will ever be challenged. As far as the al pastor this was the winner of the night. The strong pungent flavor of the seared chunks of pork blended just right with the salsa and soft grilled corn tortillas . I got a little over-indulgent with the salsa verde and had to buy another bottle of water to cool myself down but it was worth it. 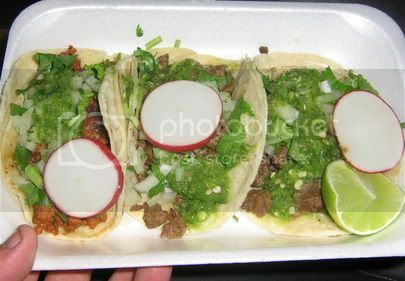 These were good tacos. If you're ever stuck in rush hour traffic on venice blvd I suggest taking a moment of serenity to pull over and enjoy a plate of tacos and a cold beverage. 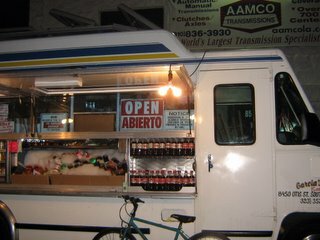 I even suggest going out of your way to eat at this taco truck. It's probably the best on the westside. Just finished 4 asada tacos. For me they were good, but nothing too special. Bothe the salsa verde and rojo are quite hot, more so than other trucks I've been too. But this isn't a complaint, I like it hot. The only poblem is the tacos were too salty. I mean, from a scale from 1 to 10, 1 being just right and 10 being inedible, it was probably a 6 or 7. Pretty salty! 2 tacos would be my rating. 3 if it weren't for the salt. Garcia Bros is a solid truck in Culver City. It's not the best tacos in LA, but definitely above-average. Disagree on the 3 star, should be 4. They've got some fire salsa.